Experienced businessman with 38 years dealing in the international commodity trade. Joined Eswaran Brothers in 1979 and held the position as Director Imports (Foods) ofEswaran Brothers (Foods) Private Ltd till 1999. During year 2000-2007, served as the Trade Representative for LimakoSuikerB.V., a leading Sugar export company based in The Netherlands. In 2008-2014, appointed as the Country Manager for Energy Commerce BV, The Netherlands, which involved management of Bonded Warehouse operation for Sugar in Sri Lanka. 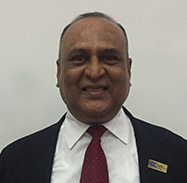 From 2014 to date, engaged in activities in the capacity of an International Commodity Trader transacting business with many Principals and Trade Houses – internationally for Sugar, Rice, Dairy Spices, Pulses and Grains.Subsequently commenced a venture as Vinu International Trading Company (Pvt) Ltd. being appointed as Managing Director /CEO.